sleeve, including our proprietary Sway modulation; a powerful and versatilecontrol only found in Jack Deville and Mr. Black products. 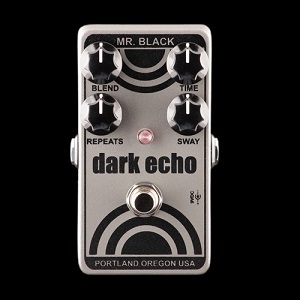 Originally introduced in 2008 and discontinued in 2012, the Dark Echo is reborn with a lower noise floor and enhanced Sway modulation. With approximately 30mS–450mS delay time. This isn’t the bright echo and you gotta set the mood. Endless, rich echoes which get progressively darker and thicker with each progressive repeat. If you wanna get freaky, start bringing in the Sway control. Be sure you’ve got your sea legs. Of course, every Mr. Black pedal is designed and hand made in the rainy pacific-northwest; smack dab in south-east Portland, OR. Dimensions: 2 1/4" X 4 1/4" X 1 1/4"